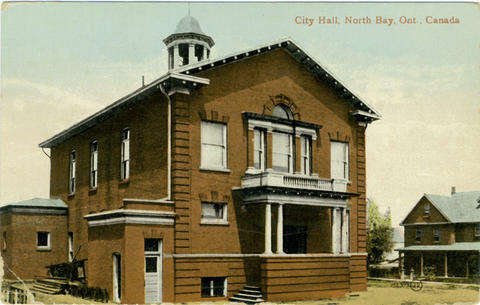 Item 012 - City Hall, North Bay, Ont., Canada. 105.373 J.N. Attributions and conjectures: The number and J.N. on the front suggests this image was created by John A. Noel. Card is cancelled North Bay, Ont., 1914. It is addressed to: Miss Stockdale, Trout Creek, Ontario. Message reads: Tuesday 7:30 p.m. was just thinking about you Hope you have good a good "supper" & bed & dont work to hard hope you meet some nice people there I will try & get down. I have just had supper. bye bye. A. C. W.